James Everett Masterson, age 89, of Willow Street, PA went home to be with his LORD and Savior Jesus Christ on November 28, 2017. He was the loving husband of Virginia Felten Masterson, to whom he was married for 67 years. Born in Elizabeth NJ, Jim was the son of the late James Everett and Ruth Reynolds Masterson. He grew up in Union, NJ and was a graduate of The Pingry School. He graduated from Wheaton College (Wheaton IL) with a B.A. in Business and Economics in 1951. He continued his education in graduate studies at NYU receiving an M.B.A. equivalent in Marketing from American Management Association. He proudly served his country as a Sergeant in the U.S. Army during the Korean War, and was involved in the Counter Intelligence Corp. in the 1st Army Battalion in Washington, D.C. from 1951-1954. After moving to CT, Jim served as a Master Franchise Distributor with ServiceMaster Industries for 35 years in CT, MA, and NY, where he opened 6 branches and developed a network of 49 ServiceMaster Licensees throughout the area. Prior to moving to Willow Valley, he was an active member of Calvary Church in West Hartford, CT, where he served as Trustee, Deacon, and member of the building committee and mission board. He was also active in the Gideon’s International distributing Bibles in jails, hospitals and hotels. He attended Calvary Church in Lancaster but in recent years has been a member of Grace Community Church in Willow Street where he served on the building committee. 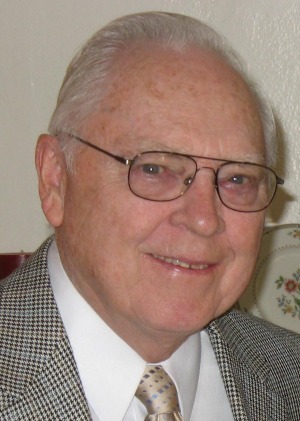 James also served on various boards during his lifetime including Africa Inland Mission, Christian Camps, Inc. Gordon College, Hartford Rescue Mission, and ServiceMaster of Connecticut River Valley. His hobbies were hunting, fishing, golfing, camping, traveling, and spending time with his family. His summer cabin in upper state NY has been a focal point of family gathering and fellowship for over 64 years. Being there and sharing this place with friends and family was the joy of his heart, as well as supporting the ministry and mission of Deerfoot Lodge. It was here at this Christian wilderness camp for boys on Lake Whitaker, where he came to know Jesus as his personal Savior and LORD as a young boy. He is survived by his wife, Virginia, his son Robert (husband of Priscilla) of South Hamilton MA, his son David (husband of Rachele) of Aberdeen NC, his daughter Lois (wife of Jim) of Pawcatuck, CT, and his daughter Carolyn (wife of Mark) of Kenya, East Africa. Two sisters, Helen Del Guidice and Barbara Reynolds, predeceased him. He was the proud grandfather of 15 grandchildren and 20 great grandchildren. Known as a man of character, gentleness, and kindness, Jim’s greatest joy was serving others. And his greatest accomplishment was the legacy of faith and love that he passed onto his family by how he lived his life with consistent dependence upon God and love for His Word. Relatives and friends are respectfully invited to attend a Celebration of Life Service in the Thomas Auditorium of Willow Valley Lakes Manor, 300 Willow Valley Lakes Drive, Willow Street, PA 17584 on December 18th, at 10:30 a.m. There will be a receiving line from10:00 – 10:30 and then again following the memorial service. In lieu of flowers, a donation can be made to Deerfoot Lodge, a Christian wilderness camp for boys, to the James Masterson Memorial Fund, that will provide scholarships for boys to attend the camp. Please makes checks payable to Christian Camps Inc., designated to the James Masterson Memorial Fund, and mail to: Robert Masterson, 198 Essex Street, South Hamilton, MA 01982. We are so sorry for the loss of your dear Dad. What an amazing person he was and Lois you are certainly his daughter and your family follows in his steps also. He is heaven looking over all of you now. I’m so sorry on the loss of your dear dad! Uncle Jim was always so kind and gentle with a twinkle in his eye. Love you all! Jeanie and I are deeply sorry to hear that Jim has passed. He and Ginny were golden threads in the tapestry of my life. It is our honor to attend the Memorial Service and, reconnect with members of the family for whom our fondness of heart has never waned, and honor this great man of God. Al and I were deeply saddened to hear of Jim’s passing. We loved him dearly and will be forever grateful for the role he, Ginny and the Masterson Family as a whole played in our lives. We are honored to join you in celebration of the many years God blessed him with. We will be staying at the DoubleTree tomorrow and will be at the memorial service on Monday. With our deepest sympathy and much love! So sorry to hear of Uncle Jim’s passing! Extending our deepest sympathy and heartfelt prayers for God’s comforting arms around you! What a blessing to know we shall see him again and he has he has merely stepped into his heavenly home. Craig and I will be attending the service. Sorry for late notice. Traveling out today. Our thoughts and prayers to you today.